Please welcome Stephanie to Faster Than The World. This is a column she sent in to us a guest submission. She has since agreed to join us as a regular weekly writer. Her column will be called Obscene and Heard and will be about life in college. As I sit in the café at Barnes and Noble on this last day of August, there is an entire world crashing down just two tables away and I can not help but listen in. Being a young woman myself, my first reaction is a cross between enraged “girl power” and “misery loves company”. Parts of me want to stand on my table and shout a decree: “That boy!” I want to point to the greasy kid across the way who is breaking the blonde woman’s heart without an ounce of class or manners, “is scum! Sic him!” Patrons of Barnes and Noble, the less dorky ones with some meat on their bones, would stop reading their Hemingway and Better Homes and Garden to mangle this young man with his hair slicked down thick with oil under a baseball cap. His ex-girlfriend would be handed a hardcover copy of War and Peace by the good looking, though probably gay, book store employee and she would join in, slamming the book hard into his nose, instantly breaking it. His nose, not the book. Hardcover books are expensive and one would hope they could endure the slight abuse. Then again, I did not grow up in Heather Locklear’s, Kate Hudson’s or Carmen Electra’s house, so maybe sometimes people really are attracted to The Bad Boy with a guitar…years before they get divorced. The experts say that girls marry men who are like their fathers. One can only assume their fathers showered just once a month. I myself grew up in a typical Jewish household. My father is from Jersey, but he stays clean and is only five foot six, which may explain my strange fascination with Woody Allen. 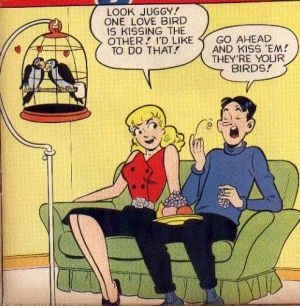 “We can still hang out,” my newfound Archie says to the side of second-rate Betty’s head and she twists her mouth, and I not sure whether she’s going to speak or keep mute. Since I am a college student, I recognize this part of the conversation. “We can still hang out” is the equivalent of a “dude” saying, “We’re taking a break”. In a lot cases, it just means he would like to keep his options open. I always believed honesty is the best policy. These “dudes” should just put on their “man pants” and explain, “You won’t sleep with me so I’m going to date around, but I still think you’re hot so I’ll keep you on the backburner just incase this thing with your friend Michelle doesn’t work out.” It would save women from a lot of sad nights clinging to their cell phone incase their little non-boyfriends called for some coffee or to “just to talk”. On the flip side, I understand this kid’s dilemma. He is a young guy after all and probably started college just that week or was leaving for some party school in Texas after Labor Day. Who wants to spend “The Best Years” tied down to some “chick” from their hometown? No one, unless they are the main character of a John Cusak movie. Not even Boy Meets World’s Corey and Tapanga could keep their act together through college, and they were on primetime television. The two had so much built up tension that they even fought over how Tapanga did her hair. I distinctly remember that episode. It really struck a chord with me. It taught me, at the tender age of ten, that not all relationships are perfect. Not even on television. Betty laughed and then left without saying another word. 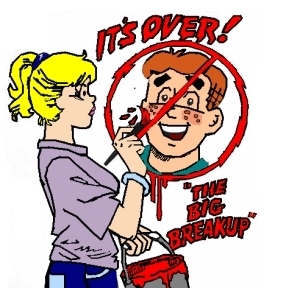 Archie followed suit not long after, and I assume their lives both went on, but I am forever scarred. Lord help me, I do not ever want to date a guy who even has a top eight list. I pride myself on my taste in men (typically older, ex-presidents and movie stars I never have to worry about meeting) and wonder; is it really that easy to fall prey to some guy who can’t even figure out his own pant size? Too much trouble to actually break up with a girl face to face. I usually just forward one of these to her gmail and forget about it. Nice work... Welcome to FTTW!! Great column. Weclome to FTTW! Poor Betty never got what she deserved though, did she? Archie's a nut. And Betty liked to cook! Aces! Finn, you're smart, like, Dilton Doily smart.